The Single Sign-On integration allows a common authentication for NetSuite and Virtual Contact Center. By logging in to NetSuite, the user automatically signs in to Virtual Contact Center. The user is required to enter the authentication information only once per session. Note: Moving to Single Sign-On integration from Individual System Sign-On is a one-way process. Once you set up Single Sign-On integration for your tenant, you cannot revert to Individual System Sign-On. -iframe is not supported: The 8x8 Virtual Contact Center appears on a separate browser window. -Single Sign-On is the only option for new customers. Existing customers cannot revert to Individual System Sign-On once they choose Single Sign-On for integration. The change from Individual System Sign-On to Single Sign-On is done at the tenant level, and is therefore applied to all agents. Once you choose Single Sign-On, you cannot go back to Individual System Sign-On. You can associate only one tenant per Virtual Contact Center bundle. To work around this, contact 8x8 Professional Services. Go to Customizations > SuiteBundler > Search & Install Bundles. 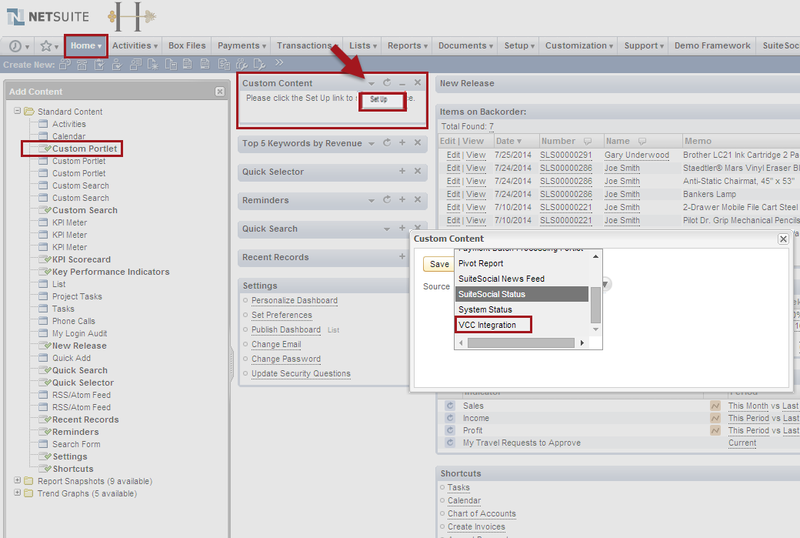 Type <8x8 Virtual Contact Center>, and click Search. From the resulting list, select 8x8 Virtual Contact Center - 2.0 with bundle ID 104067. Click Install. The Preview Bundle Install page opens. A page opens with a list of the installed bundles. The status of the new bundle is Pending. In the NetSuite Setup menu, go to Integration > SuiteSignOn. A list of bundles appears. The SuiteSignOn page appears containing the Connection Points tab. Edit the URL field value to match your cluster URL. In the URL, <X> is the Virtual Contact Center instance your tenant is created on, and <yourtenantname> is your tenant ID. The screen pop feature allows agents to access and preview customer records before accepting a call. It reduces time in identifying the customer. To enable automatic screen pop for interactions, you must configure screen pop settings in Configuration Manager. 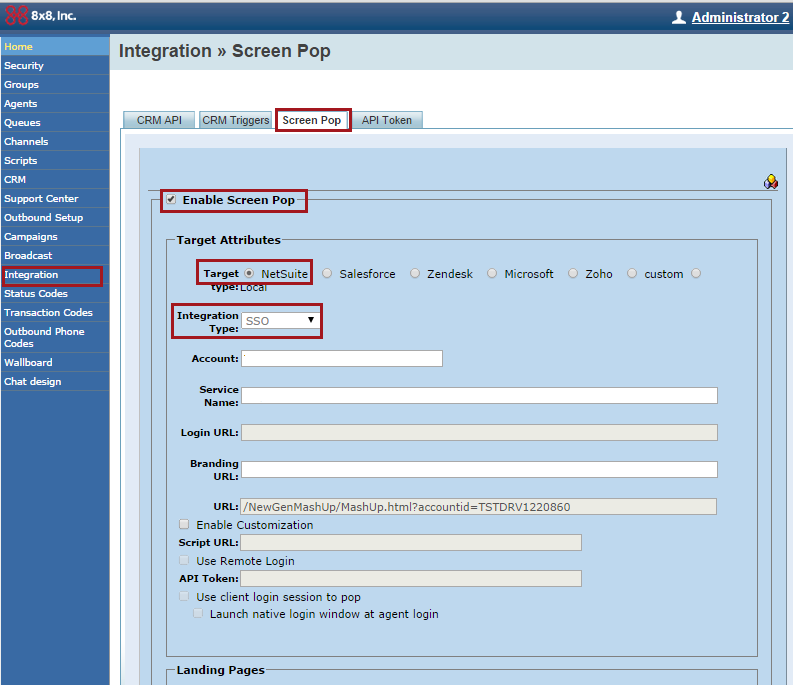 In Configuration Manager, go to Integration > Screen Pop from the navigation menu. 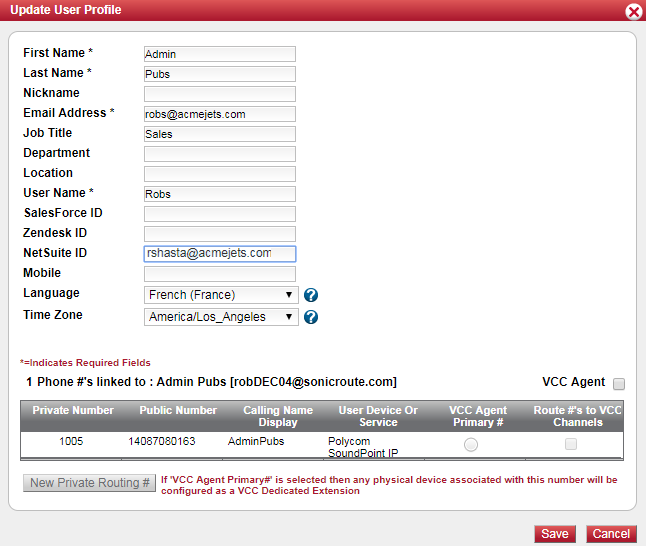 For NetSuite users to log in to Virtual Contact Center, you must create an agent account in Configuration Manager. You must then link the agent account to the NetSuite user account with the same email address. See Create Agent Accounts in Virtual Contact Center for more information. Before you start, locate the agent’s email address in NetSuite. 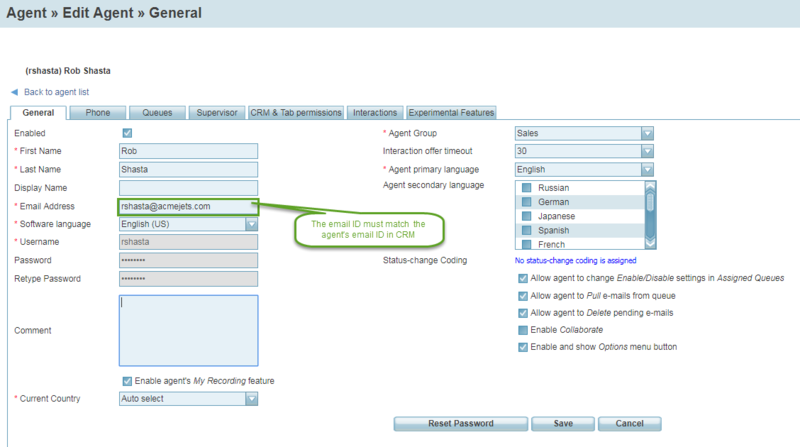 Note: If an agent changes their email ID using Agent Console, the Virtual Contact Center login fails. Go to the Agents or Users tab to create a new agent for NetSuite, or use an existing account. In the General tab, make sure the agent's email address matches the user's email address in NetSuite. Go to Accounts > User Profiles and edit the user profile of the prospective NetSuite user. Enter the NetSuite ID and click Save. 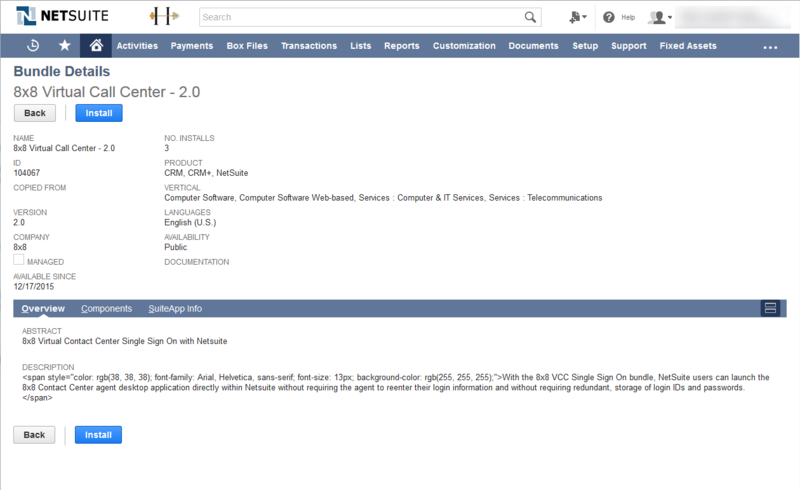 Go to Home > Users and edit the user profile of the prospective NetSuite user. In NetSuite, go to Home > Dashboard. On the Dashboard page, click Personalize Dashboard, or find Settings and click the Personalize Dashboard link. An empty portlet is created. In the new portlet, click in the top-right corner. In NetSuite, go to Customization > SuiteBundler > Search & Install Bundles > List. Locate 8x8 Virtual Call Center in the list. Hover over next to the Virtual Contact Center.